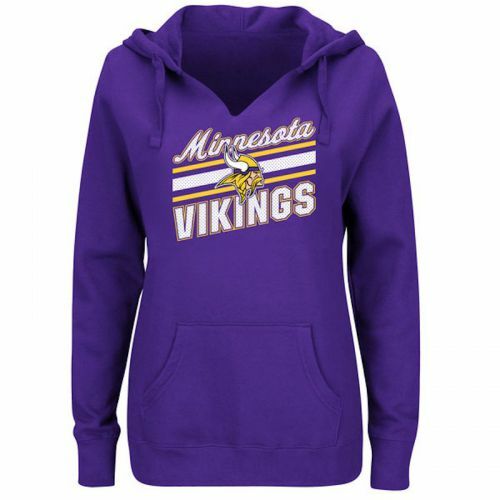 Minnesota Vikings women's plus purple Highlight Play v-neck hoodie by Majestic has hood with purple drawcords, ribbed cuffs and waist and front handwarmer pocket with Minnesota Vikings, the Vikings logo and white and gold stripes screen printed in mesh look on the front. Available in women's plus sizes 1X, 2X and 3X. (HERNFL74Q) 80% Cotton/20% polyester. Service Area: Shawano, Appleton, Stevens Point, Appleton, Menasha, Kaukauna, Waupaca, Schofield, New London, Clintonville, Pulaski and surrounding communities.